Hi - another newbie here. Please be gentle with me! I have had a sausage maker (manual stuffer) since 1995 and have been inspired by you all to dust off the cobwebs and have a go. Do I have to add all the additives like preservatives etc? I mean they wont need a shelf life or anything like that so am I ok just to make them without? I still have to make up my mind what to order - is the ordering with a credit card safe - well I suppose it must be but being an internet purchasing virgin I am understandably a little wary. Thank you. If you browse through this forum you will find pretty much everything has been covered and most of your impending questions will have already been asked and answered. I dont put preservatives in my sausages but I make sure I eat them PDQ or pop them in the freezer. Once you have minced your meat the shelf life shortens so I tend to keep them in the fridge no more than 2-3 days before they become freezer fodder. Thank you both very much - I will give it a go - although I hope my wrists dont give out due to the hand action on the manual stuffer!!!! I think its an obsolete instrument. Anyway thank you again. Well it's a month since the last beginners posting so we will keep the pot boiling so to speak. Being an avid artisan cheesmaker for a few years I wanted to spread my wings a bit included in my repetoire was Haggis as there is a Scots in the family. I was searching around for some skins other than those I got from the local butcher, I wrote to a firm and they very kindly sent be some plastic skins about 3 inches across...ideal for a liver sausage or a breakfast sausage. Now I only had a kenwood sausage maker/stuffer and this was only good enough for chipolatas so the bigger skins I had to stuff by hand with a tin tube and a poker. My main problem was spice mixes as I never knew these forums existed. When I was a butchers boy during WW2 we used to maker sausages when the meat was available and some weired meats used to go into those I can tell you.....but in the downstairs old fridge which was used as a store room there was a couple of sacks of spices for the sausage mixes. One was red and had a delghtful spicey smell the other was white and went into the pork sausages,,,,in them days the stale loaves from the bakers used to go into the sausages and as much bread as possible was used. The sausage stuffer was a huge Reber type with a side handle that I used to have to crank whilst the butcher handled the links. I have just acquired a reber stuffer that I bought off of ebay. It was used once to make a batch of sausages for a barbeque and is praticaly new in it's original box and cost me ï¿½80. My technical questions are what beef cuts does one use for beef sausages ?. I have made beef burgers with a franco burger press using 50/50 rump steak and pork belly with his texan spice mix and they were delightful. and if I make pork sausages I will use Shoulder and belly. What I have to be careful at with the beef sausages is not to have any bits of gristle or the like because the kids don't like bits. I must make some saveloys and I am sorting out one of Parsons spice mixes to use. I got some calogen skins with this machine does one have to soak these before use? They seem a bit fragile and papery. Rik vonTrense wrote: My technical questions are what beef cuts does one use for beef sausages ?. Congratulations on grabbing the stuffer, that's a good price. As for beef, I usually use some beef chuck when making beef-based sausage. I made my first string of sausages on Sunday, which even if I say so myself, were a great success. While I was making them, everyone said how disgusting they looked, and that I had better be prepared to eat them all myself (which I was). Once complete, the moans changed to "Wow - those look just like real sausages"! And once I started cooking them, four pounds got eaten by family and friends by the end of the day. I used 3lb of pork belly and 3lb of shoulder, with a 'pork & apple' rusk/seasoning mix, 6 cloves of garlic, a handful of sage and a glass full of sake (and 400 ml water). Using a number 10 mincer with 6mm plate, I minced the pork, and mixed in the other ingredients. When stuffing the hog casings, I had great difficulty getting the mixture back through the mincer. Unlike the first mincing operation, where the diced pork was drawn nicely into the screw, it seemed that the only way to get the mixture through was to be constantly pressing it down in the hopper. This wouldn't have been so bad, but with one hand turning the crank, and the other controlling the sausage extrusion, you needed an extra hand! Is this just a fact of life with a hand mincer, or would it imply that the consistency of the mixture was poor? With a little experimentation, I managed to tie the sausages in a long string of threes, which, even if I say so myself, looked really professional. When I cut them up and started cooking them, however, some of the ends opened up, and the filling expanded out. Not a huge problem, I know, but I wondered if this would infer that I had not twisted them sufficiently, or had overstuffed the casings? When cutting into a finished, cooked sausage (mmmmm), they had a tendency to be a little crumbly, and did not hold together very well. Again, not really a problem, but would this be due to not having enough rusk, not sufficient fat, or just being in too much of a hurry to eat them? I know these points are only minor, but in my quest for the perfect sausage, I think I'm going in the right direction. I'm a bit of a sausage novice too. I'm trying to make "all meat" sausages specifically without the rusk and all the liquid it absorbs. Hence I'm unfamiliar in the ways of the stuff - but - it sounds to me as though your forcemeat mix may have been too dry and stiff. I gather that you added about 600ml of liquid to about 3 kg of meat and an unspecified quantity of dried apple, dry rusk, and (possibly dried) sage. It sounds dry to my inexperienced ear. The stuffing difficulty (and I think the swelling) sounds also like a bit too dry (with rusk). Were there any suggestions with your flavoured rusk as to an addition rate, wrt the meat, and the amount of liquid that should be added with it? However, re-mincing while stuffing (something I gather some folk try to do) makes things even worse. You should try to give the meat the simplest, free-est, passage to the stuffing horn. hi Muncher, the mix of belly, and shoulder should give you enough fat. The only thing i can suggest is to add more water, and make sure you give it a really good mix before stuffing. i'll include a pic of my last sausages. 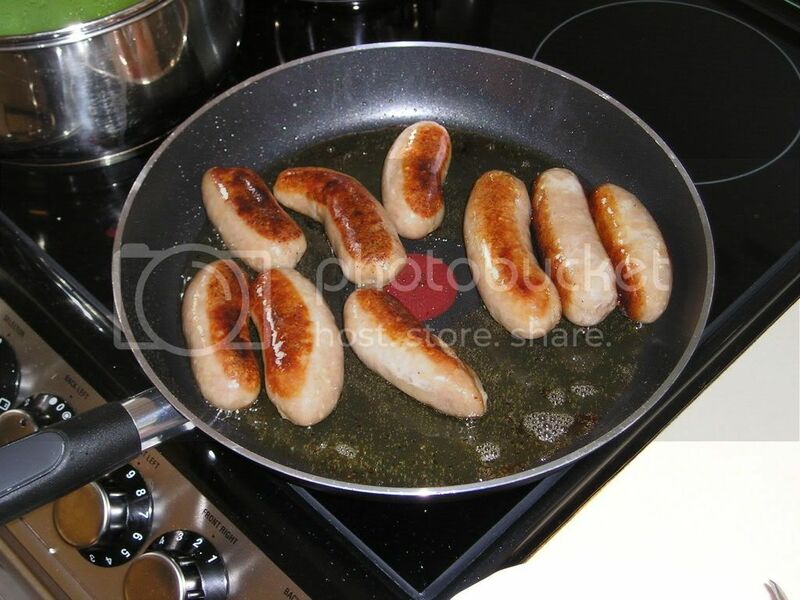 Note the oil in the pan is not from the sausage. es. cheers john. Thanks for the tips everyone. It sounds like the general view is that is was all a bit on the dry side. I'm interested to know, Dougal, what the result is without the rusk. The stuff I used was all premixed with the seasoning for a fixed amount of meat. I had read that a small amount of rusk was a necessity to bind it all together, but then you seem to get different advice wherever you look. I'm all for leaving it out, but what is the effect? I'm beginning to get the feeling that Santa may have a vertical stuffer for me tucked in the bottom of his sack. You'll get different recommendations, because people have different preferences. But also they can have different understandings. The standard *British* sausage has rusk (and various other stuff). Its kinda what most British folk expect. So primarily preference and expectation. I'd rather not dilute or 'extend' the sausage ingredients. But that's just me. And a load of foreigners! So much for the effect on result. "Chaqu' un ï¿½ son gout" as the neighbours say. As to the effect on method. I think I may mix it more vigorously than one would need to if one was using binders, emulsifiers, etc. And I suspect that the mixing temperature may be more critical (need to be lower). I'm not an expert on this by any means. But I'm sure there are many more expert (particularly in the use of rusk) than myself that can give their opinions. If you are getting a texture at all like cooked mince, yes it could well be under mixing - but if was minced to hot, no amount of mixing will give you a properly smooth (non-gritty) sausage. Some folk cut up their meat to size for their mincer, marinade it in the fridge with their flavourings, then chill it for half an hour in the freezer - and mince it while its still 'crisp' from the chilling. *Cold* mincing does make a big difference to the sausage quality. After mixing, before stuffing, it really is worthwhile to make a slim mini-burger (1 or 2" diameter) from your forcemeat and fry it immediately. Apart from checking flavour and seasoning, you'll get some idea of the likely texture. And at that stage it's still possible to try and make changes if needed. I tried using some more water this time, and ended up with quite a squelchy mixture, and that seemed to do the trick; - it all haung together much better. Hi. I just made my first batch of sausages following those nice clear instructions from sausagemaker's post. Thanks! I used a mixture of shoulder and belly pork, hog casing, and Lincolnshire seasoning, and the process was carried out using a Kenwood Chef, mincer attatchment and sausage stuffing tube. They seem to have turned out rather well and currently they are sitting in the fridge to 'bloom'. I'm just glad I didn't tackle the job when I was at home alone, I think you need about 3 pairs of hands for a beginner! Can anyone tell me how to re-salt the leftover casings, and how long will they keep for please? (Sorry if this has been answered before).